Contour Crafting just won a major design prize for its ability to 3D print large-scale structures from computer-aided design (CAD) files. 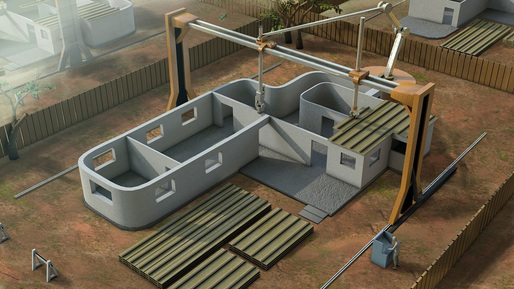 Berokh Kohshnevis‘ “robotic building construction” system can print entire buildings quickly and efficiently, and it has the potential to provide reliable housing in post-disaster situations. The technology won the grand prize in the 2014 Create The Future Design Contest hosted by NASA Tech Briefs, and Contour Crafting will receive $20,000 and a special feature in the magazine. 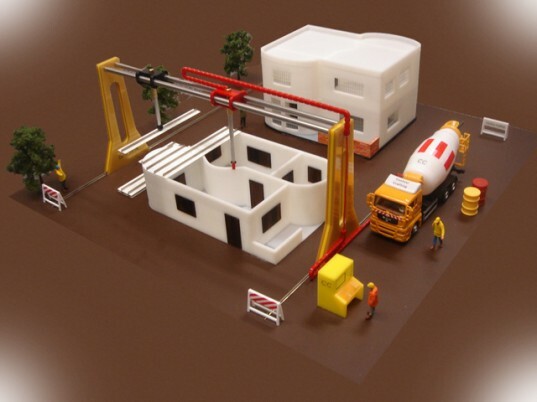 Contour Crafting is the world’s first and only large-scale 3D printing technology, and could have major influences on how our homes are designed and built. How it works is very cool. Walls are formed via extrusion of a paste-like material similar to concrete and smoothed by a robotic trowel. They can be built in all manner of forms ranging from traditional ‘boxy’ styles to more modern curved designs – and needless to say architects are very interested in Contour Crafting’s capabilities. From the descriptions and explenations that I've heard, virtually any form of concreet, and even some forms of mud/clay can be used as crafting materials. The concrete that has been used an stand up to 10,000 PSI, so I'm more than positive that would be able to withstand virtually any storms thrown at it, even tornado hurled boards.... Being that the primary components of concrete are lime added with agrigate, and depending upon the properties of the hardened product you might add volcanic ash or other components as well. Most are redially available in many areas. The shape of a dwelling or building can also determine how well it withstands storms. With the process of printing that is proposed, virtually any CAD designed structure will eventually be able to be built. Designing easy access panels for electric/telecommunication lines and water/sewage lines would likewise be relatively easy. Will you be able to say if building materials will be able to withstand the increasing velocity of the new hurricane storm winds. How much can they withstand. Will it be practical to use in the tropics. What about obsolescence. People in the tropics are concerned about the new hurricanes. Computer generated image of Contour Crafting at work. A mockup of what a Contour Crafting project might look like.